The Kell Process philosophy is common to all Kell flowsheets for treatment of a range of feed types. Impurities are first removed in two sequential steps and, where appropriate, value metals and other by-products are recovered. Once impurities are removed a conditioning step may be applied, whereby the purified feed is upgraded and prepared for subsequent separation and recovery of remaining value elements. 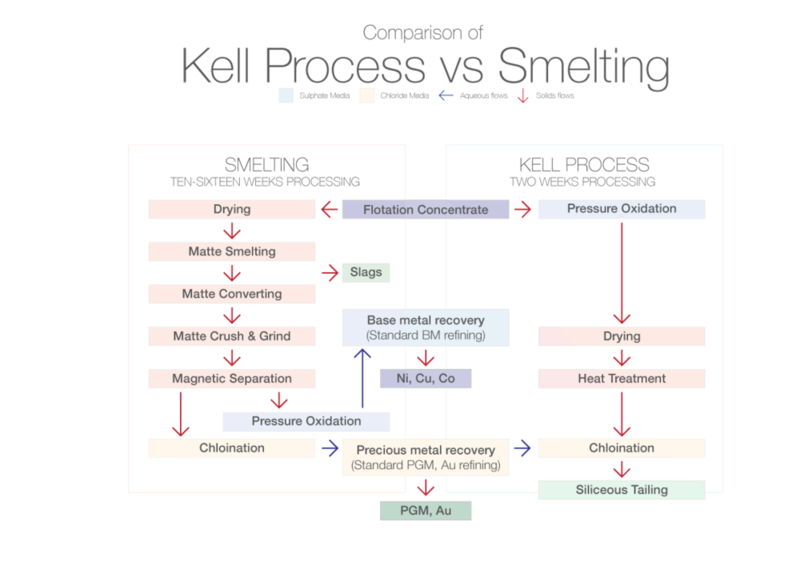 As applied to treatment of PGM concentrates, the Kell Process comprises four main unit operations (pressure oxidation, atmospheric leach, heat treatment and chlorination), all of which are conventional and in comercial use in the minerals and metals industry. For PGM concentrates, S, Ni, Co and Cu are first selectively removed by use of a pressure oxidation step during which the dissolution of PGM is minimized and base metals are separated and recovered as value-added products. The residue from pressure oxidation is subjected to atmospheric leaching for removal of soluble gangue, including iron and amphoteric elements. The clean upgraded residue is then subjected to heat treatment to condition the minerals to ensure efficient PGM recovery by subsequent chlorination. Any chromite passes to the final tailings. All the core steps are very similar to well-proven conventional unit operations in common use, as are the subsequent metal recovery steps to provide marketable end products. A key feature of Kell is that the sulfate (base metal leach) and chloride (precious metal leach) systems are kept entirely separate, enabling the process chemistry to be independently controlled and materials selection simplified. KellGold process is readily applied to the treatment of refractory gold, copper-gold and preg-robbing concentrates. While the generic flowsheet still applies and in many respects the process is similar to that for PGM concentrates, there are some important operational differences. Moreover, some of the steps in the simplified KellGold flowsheet below may be omitted, depending on the feed material. For gold concentrates, S and Cu are first selectively removed by use of a pressure oxidation step during which the dissolution of gold and silver is minimized. Sulphuric acid may be recovered and recycled, and for copper-gold concentrates, copper is separated and recovered as metal or value-added product. The residue from pressure oxidation is subjected to atmospheric leaching for removal of soluble gangue, including iron and amphoteric elements – particularly arsenic, which is stabilised into an environmentally stable form for tailing storage. For feed materials that are preg-robbing the clean upgraded residue is then subjected to heat treatment to condition the material to ensure efficient gold recovery by subsequent chlorination. Again, all the core steps are very similar to well-proven conventional unit operations in common use, as are the subsequent metal recovery steps to provide marketable end products. A key feature of KellGold is that the value elements are recovered to separate clean streams (e.g., Cu, Ag and Au streams) again, enabling the process chemistry to be independently controlled and enabling refined end-products to be produced on site – eliminating the time and cost of remote third-party refining. KellGold recovers refined gold at the mine site without the use of cyanide or mercury. The Kell-Li process applies the Kell process philosophy to the recovery of lithium from various materials, including lithium-bearing concentrates, ores and brines. For lithium brines or primary leachates, divalents are first selectively removed during which the dissolution of lithium is minimized. In a secondary purification step, other impurities are removed and the opportunity to recover any value elements as by-products is considered on a case-specific basis. A conditioning step is applied to upgrade the feed to a final lithium separation, recovery and purification step. The Kell Process consists of several commercially proven unit operations. S, Ni, Co and Cu are first selectively removed by use of a pressure oxidation step during which the dissolution of PGM is minimized. The residue from pressure oxidation is subjected to a thermal treatment to ensure efficient PGM recovery by subsequent chlorination. All the core steps are very similar to well-proven conventional unit operations in common use, as are the subsequent metal recovery steps to provide marketable end products. A key feature of Kell is that the sulphate (base metal leach) and chloride (precious metal leach) medias are kept entirely separate, enabling the process chemistry to be controlled and materials selection simplified.